Details Per Space - 8 ideas for details to make a more homely entrance — Horoma. The entrance, or lobby space in a home or apartment is an interesting place since it separates the exterior and the interior, the lively vibes of the outside and the intimacy of your place. In the same way that in real life the entrance will be the first thing you see when you first visit a place, it can also be used as a logical introduction to a visualization project you're working on. That's why it can be interesting to spend some extra time fine-tuning storytelling details. The entrance of a place is where you'll usually dress up before going outside, or hang up your coat once you come back after a long day at the office. First and foremost, the design itself. On such a small scale (house, apartment, etc.) everything should be thought through down to the smallest details. An entrance therefore is a good place to show some nicely designed storage systems, hangers, sitting systems, etc. Secondly, and quite importantly for us archviz artists, it is an opportunity to add simple storytelling details about the people who could live in this place. Fashion, sports, contemporary neat design or DIY, etc. Is it a couple living here? or a whole family? Whether it's a simple pouf to sit on and tie your shoes, some workwear clothes and a camera to sell the idea of nice outdoor adjacent spaces, several pairs of heels or a nice hat, bikes or skateboard, work-related items, today's newspaper, there are always some small objects you can place in your image to create a backstory in your image and give hints on who can live here, and help your client project into the story you're creating. Cloth is a simple way to add warmth in a rendering, as well as a bit of messiness (or tidiness if properly folded). Since you're designing an entrance, we easily expect some nice rug with a specific fabric. Simple for minimalist designs, or more furry to create a warmer and cozier feeling, all the way to a more stereotypical welcome mat. The entrance will often be the place where you'll stash your favorite coats, shoes and other fashion related items. Everybody having their own approach to fashion, the type of brands, fabrics, styles you're going to display is going to go a long way in depicting the kind of inhabitants we're envisioning for the place. Minimalist basics, haute couture garments, weekenders, handbags, these can all add a nice touch in an image as well as bringing different tones and materials. A leather weekender in a simple white interior, a flashy yellow raincoat in a modern interior. The only line you have to be careful not to cross, is to make the image all about the clothes and bags. A detail is what it is: something that builds up the realism of your image, but not your image itself. What you're selling is an idea of living, not a coat or a pair of boots. Design items range from tiny sculptures on a shelf or a window, to larger sculptures on the floor, all the way to photographs or paintings on the wall. Decoration is a huge part in making the first thing you'll see in a project, the entrance, homely. For a lobby, it can be interesting to add bespoke hangers, doorstops with an original detail (think wool-puppy from Vitra, spherical stones for door holders, wooden objects, etc.). As usual, it is always better to use your own models for this type of details rather than readymade 3d models. Of course, for time constraints it is always easier to use readymade, just don't forget to tweak them a bit, especially when it comes to paintings and photographs for which we can start to spot them more and more easily as they're used more and more. For instance, if you're dealing with a specific client, you might be able to find out what kind of artist they like. This will help you choose the artworks to display in your renderings. But please avoid stereotypical photographs in your rendering. Putting the Eiffel Tower in a frame if you're designing a flat in Paris, although decoration can give hints as to where you're at, is way too straightforward and can really ruin the whole image and design. Last but not least, this is the kind of small detail that can help you in balancing your image compositionwise, as well as colorwise. A white wall and a white wall with a black painting on it have totally different weight in an image. Adding foliage in your entrance space is a good way to add density and a bit of fluffiness. In order to keep the legibility of the space you might want to use small plants and put them in nice pots or minimalist holders. When you're dealing with light interiors, adding foliage is a good way to create contrasts with darker hues, as well as creating a connexion with the outside (green inside the space vs. greenery through the windows). Adding subtle artificial lighting in an image, while adding a bit of light in your image and helping in the legibility of the space, can also help understand how the project works, or set warmer atmospheres. Adding small lights along stairs changes the balance of the composition and gives more importance to the stairs. Playing with candlelights or low intensity ceiling light can adding a bit of warmth as well as interesting cast lights and shadows in your image. Even though we try to hide as much of the guts of a building as we can, if we can't hide it, show it properly. In a flat, you'll usually find the electric meter in the entrance, the doorbell, some light switches and electric sockets. In a modern home it could be more like a high-tech alarm setup, security displays, etc. Other misc furnishings that you'll find in every rooms but are still worth mentioning are radiators, baseboards, wires, pipes, etc. When depicting the entrance of a project, it would be a missed opportunity not to show either the outside, or the rest of the place. 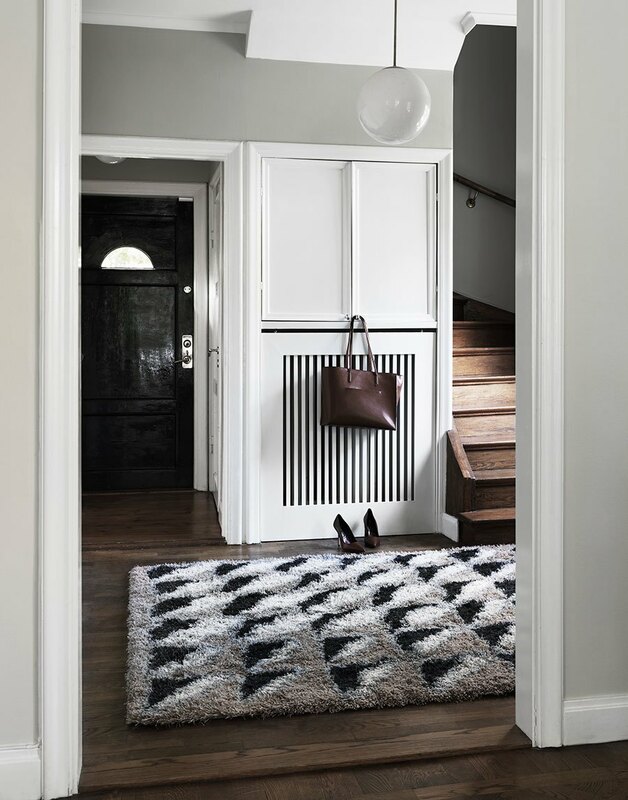 The entrance is often connected to the main rooms of the house (living room, kitchen) in a more or less open way, therefore getting a glimpse of these rooms from the entrance is a nice tip to help the legibility of the whole project. A nice alternative to directly showing the adjacent spaces is to use a mirror to reflect the other spaces. In this way you can still focus your composition on the actual lobby, while showing spaces opposite to your camera. Another cool thing to do is to open the entrance door so that we can get a glimpse at the nice neighbourghood outside. Or, the other way around, make the image for the entrance standing from the outside. That's it for the entrance space. These 8 categories are of course non-exhaustive and I'm sure you'll find many others.The idea here, and in the rest of the series, is to show you a broad range of the kind of stories you can hint at by just using simple objects in your rendering. Don't hesitate to comment and give your tips on how to make a believable and memorable entrance space. Since the idea is to make one article per space, there will be many more articles like this one for you to read so don't forget to like our Facebook page to not miss out on our upcoming stuff.